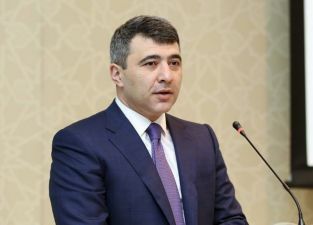 “The Azerbaijani government is taking large-scale supportive measures in order to stimulate manufacturers in the agrarian sector, reduce their production costs and increase their income-generating opportunities. About 1.2 billion manats have been paid to farmers in subsidies for various supportive measures over the past 10 years,” Minister of Agriculture Inam Karimov has told AZERTAC. The minister noted that about 44,000 units of agricultural machinery, 843,000 tons of mineral fertilizers and more than 30,000 breeding animals were imported to the country and leased to farmers on low-interest terms by Agrolizing OJSC. “The introduction of the "Electronic Agriculture" information system, which is being created by the Ministry, will ensure transparency and flexibility in the agrarian sector as well as in granting subsidies. Implementation of all services through "electronic government" will create additional benefits for farmers.” the minister said. Inam Karimov said the State Agrarian Development Centers were established under the orders of the Azerbaijani President in order to improve the institutional mechanisms of government care for farmers, prioritize service-based activities in the agrarian sector, strengthen work with farmers, and raise their awareness of the use of innovations.